Tag line: "They beat him. They deprived him. They ridiculed him. They broke his heart. 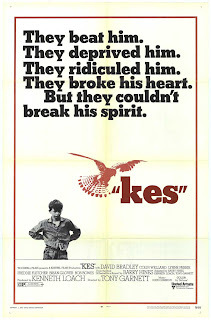 But they couldn't break his spirit"
Kes, a 1969 film directed by Ken Loach, tells the story of Billy Casper (David Bradley), a 15-year-old boy with very few friends, and an older brother (Freddie Fletcher) who bullies him. Life for Billy is rather mundane, what with school and his job as a paper boy, but all that changes the day he takes a walk through the woods and spots a kestrel flying through the air. Determined to train the young bird, Billy steals a book on falconry from the local book store, captures the kestrel, and sets up a perch for it in the tool shed behind his house . Amidst the turmoil of unpleasant teachers and a family completely indifferent to him, Billy forms a strong bond with his new, feathered companion, one which allows his imagination to run wild. Kes was shot on location in the Yorkshire town of Barnsley, and Loach spends a fair amount of the film exploring this working-class community, visiting the coal mines where Billy's brother works, and tagging along with him to the local pub, which on Friday night is packed with patrons looking to drink their troubles away. But there's no true escape from the daily routine for anybody in this town. Not even the children. In Barnsley, there are very few occupations available; either the coal mines or some other dead-end job, and because of this, the teachers at Billy's school spend more time berating the kids then they do mentoring them. Why pass along knowledge when there's little chance anyone will ever actually use it? In one humorous sequence, the school's gym teacher (Brian Glover) drags Billy and the other boys out to the football field, where, as opposed to teaching the finer points of the game, he uses them all to act out a personal fantasy in which he's a professional player, battling for the championship (at one point, he even cheats to score a goal). The headmaster (Bob Bowes) at Billy's school is a particularly nasty fellow, ordering Billy to his office after the young man, tired from staying up late with his kestrel, falls asleep during the morning assembly. Lined against the wall with a number of other boys, Billy is forced to listen as the headmaster belittles their entire generation, reciting a speech he's undoubtedly spouted off dozens of times before. He offers no solutions, nor words of encouragement, because he has neither to give, and punctuates his tirade by striking each boys hands with a cane before sending them on their way. And yet, even with apathy surrounding him on all sides, Billy manages to inspire himself, and won't permit anything to stand between him and his new-found passion. Looking for a book on how to train kestrels, he first visits the public library, where he's told he cannot take a book out unless he's a member, and he can't become a member until his mother (Lynne Perrie) signs his application. He tries negotiating with the librarian (Zoe Sutherland), hoping to convince her he's responsible enough to take care of one simple book, but to no avail. It's she who sends him off to the used book store, where, due to the fact he has no money, Billy hides the book he needs under his jacket and walks out the front door. The moral dilemma of having stolen the book never enters the picture; Billy wanted it, and was resolved to have it by any means necessary. 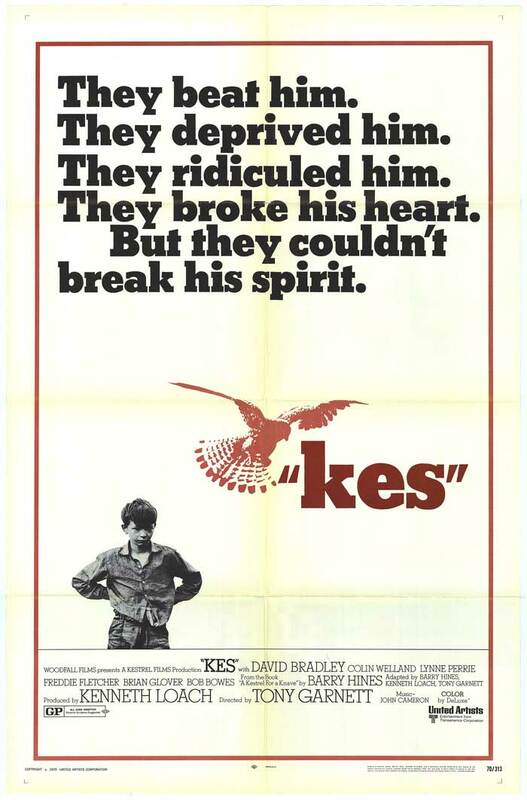 Beautifully shot and expertly constructed, Kes is a story of hope set against the backdrop of hopelessness, of a boy forgotten by the world who challenges himself when nobody else will. With his kestrel, Billy has shown he's capable of more than anyone's given him credit for, and that alone has taken him places most of the adults in town will never know.